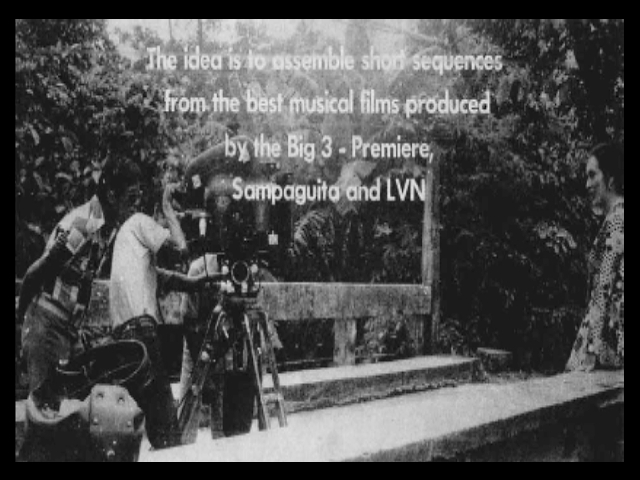 “…The idea is to assemble short sequences from the best muscal films produced by the Big 3 – Premiere, Sampaguita and LVN. It’s Digna Santiago on the phone giving it straight to tme like an IBM machine: “Sampaguita, LVN and Premiere are reproducing a full-lenght movie for the first time. It’s going to be a collection of film clips from their best movies since the 40s. The two studios hired their own researchers already. Can you research for us? Your associate will be Bernardo C. Bernardo.” Will I? Deal, I said with a school-boy enthusiasm. Cirio told us that the idea was to assemble a sizeable collection of short sequences from the three studios’ biggest hits. Bernie and I would work in the film library of Premiere. The co-production vernture was actually Cirio’s baby. His enthusiasm was so infectious that he was able to convince Mike de Leon of LVN and Bobby Vera Perez of Sampaguita to finance this unique production with him. The original plan was to produce, firstly, a straight documentary on the film trends in the local cinema from the 40’s up to the present and the superstars who glittered and captivated the audience for more than three decades. This was to be titled Remember When. It would be followed immediately by Happy Days Are Here Again!, which will showcase a compilation of the musical comedies produced by the three studios. Cirio said that he had already contacted Lamberto Avellana to direct the movie. We were mesmerized by the imposing personality of Avellana whose anecdotes and witticism thrilled us like starry-eyed schoolchildren. Avellana said that documentary films are too stiff and not appealing enought to lure theater-goers. “We can’t spend more than two hundred fifty thousands grand for this film!” he emphasized. The hazy vision on the crystal ball finally became clear. The producer were making the movie on a shoe-string budget! During the pre-production talks, they couldn’t decide whether to cut the original budget – or splurge the four hundred fifty thousand bucks that Avellana wanted for the movie. They were frankly shocked by the “staggering” cost of the movie. Avellana wanted it spectacular in size. The producers were nervous. Meanwhile, the researchers began working at LVN. Socrates Jose and Eman Lacaba started reviewing old films inside the studio projection room and so did the Sampaguita group of Medy Tarnate and Joel Apuyan. Bernie and I were deep in research work at the studio editing room. To our dismay, the films we wanted were not available either because they were lost or the negatives had been destroyed. For instance, when Bernie and I wanted a copy of Bakya Mo Neneng which starred Rosa del Rosario, we were informed by the studio property master Ben Llenado that they didn’t have the negatives of the film anymore. Not even Cirio’s repeated orders of “Find it!” could help locate the film. The LVN researchers wre on the same boat with us. Three of their musical comedy classics – Ikaw Kasi, Bahala Na (the first local film photographed in cinemascope type of lens called “MagnaScope”) and Tingnan Natin had been lost foreever. The studio didn’t have the copies of these three films! The same thing with Sampaguita’s Madaling Araw and Paru-Parong Bukid. Only the Big Broadcast had survived. While Cirio was preparing for abroad, Medy and Tiny worked on the second script. The verdict of Mike and Bobby was the same as on the first: Weak! When the third script was okayed, for the first time in more than a month of constant changes and editing, we were jubilant for a change, until Rosa Rosal, the leading character on the revised and okayed script dropped the bomb: She wanted P15,000 for three days of shooting! “Too much!” the producers’ blood temperatures rose, and we saw the third script slide down to oblivion. Earlier, they were even considering Dolphy for the musical finale of the movie – sort of a take-off from his El Pinoy Matador entry from Premiere. “Just imagine Dolphy with 50 toreadorabelles all in red,” enthused Avellana. But when they learned that the comedian’s asking price now is P300,000 per picture we said goodbye to Dolphy and his 50 dancing toreadorabelles all in red! We were back again to zero. We were getting nervous as we sensed that the producers were contemplating on giving up their joint venture. In fact, Mike was all for abandoning the project. He was preparing for his trip to Germany to purchase new color processing equipments. Even the researchers were quarelling. When Peping Tarnate, our film editor, submitted his report on the running time of the film clips of each studio we found out that Sampaguita has 18 minutes, Premiere, 22 and LVN, 48 minutes! When the producers asked for the complete and final presentation of a new screen treatment for Happy Days Are Here Again!, we knew taht it was an ultimatum to produce something – or else! Suddenly, the dreaded specter oozed its frightening apparition before us. The bouncing baby had become an uncontrollable muti-headed monster! Bernie and I started arguing. One time we scandalized the LVN canteen with our “shoutings” and Soc joined in, banging the chair on the table that an outsider rushed inside our office. “What’s happening here?” he asked worried. “Nothing. Just discussing the script.” we answered like innocent school boys. The “Five Fingers,” too were on each other’s nerves. I couldn’t stant it anymore. Finally, we agreed to be clear headed about it. The project was in danger of collapsing, we couldn’t afford to be petty with our feelings anymore. Avellana gave us encouragement. “Fight, boys, fight!” he enthused again like a cheer leader. With that, we worked on our individual scripts. It was Lina Santiago (who was representing Premiere on behalf of Cirio and her husband, Danilo) who read the script first. “Its much better this time and so many ideas to choose from,” Mike read the scripts in his office. Bobby was down with the flue but sent word that he’d go along with the decision of Lina and Mike regarding their final choice of the script. Premiere wanted to start the production rolling and offered to buy LVN’s share on the venture. But Mike refused. He knew that without the LVN films clips, the entire film would collapse like a pile of tarot cards! And besides, Mike himself was aware of the fact that LVN had the best entries. And he was right! Amidst the producer’s vaccilation and the production’s somnalent state, I gave the whole affair a shrug. I have other responsibilities to attend to. Two weeks later, a call from Premiere office asked me to be present at the HDAHA staff meeting. News was Ciriio just arrived and he was re-organizing the project – or what was left of it. I was glad to come. After two weeks, I’d see my friend again. In the movie, despite internal dissent, affection prevails. This I found out. The sight of Soc, Bernie, Tiny, Medy and Eman restored that warm glow of enthusiasm and concern I had for the project. The next day, we wre once again in a panting flurry of actions. Once in his orbit, Cirio’s powerful motivating force seems to pull us in dizzying spins. Also, his volatile temper sent us coming and going like comfused rabbits! He asked the researchers of LVN, Sampaguita and Premiere to add more entries to the previewed and edited later. he gave his basic story line for Medy and Tiny to work on. What do you know – it was the original idea we had before! Talk about going in circles! “What happened to our best musicales? Hawaiian Boy? Basta Pinoy? I didn’t like our Eddie Mesa entry. Too simple. We have plenty of Eddie Mesas. Rolling Rockers, Singing Idols…” Cirio rattled on. The next morning, I sent a report on our research work the whole day to Cirio: Hawaiian Boy and Basta Pinoy are beyond salvage. Also, no prints or copies are available at the studio, Eddie Mesa’s big scene in Singing Idol is what you want it to be: Spectacular. But sorry, we can’t find the sound reel. We await your instructions. When our energetic “general” scheduled our first shooting day at the Sampaguita studiio, we were excited and bewildered. One question nagged us: What happened to Avellana? We asked Cirio if he had already informed him of the changes in the project including the script and that he (Avellana) was no longer to direct the HDAHA movie for the Big three. This entry was posted in ARTICLES and tagged ARTICLES, Happy Days are Here Again (1974), The Making of Happy Days Are Here Again. Bookmark the permalink.